Fossilised Dinosaur Poo. 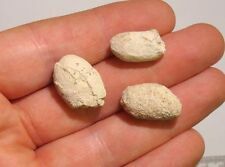 Single piece of Premium Coprolite Fossilized Dinosaur Poo 140 million years old. Authentic sample of coprolite, the fossilized waste of prehistoric animals! Piece of coprolite with an information card included. This hardened material is known as Copal, which preserves the inclusion perfectly. Age: Miocene. Finally after hundreds of thousands, or millions of years, the land is eroded and the fossil can be seen. Age: Eocene Period. This hardened material is known asCopal, which preserves the inclusion perfectly. This is 56-33.9 million year old Baltic amber which houses an inclusion. Location Found: Baltic Sea. Thesiphuncle is a tube that runs the entire length of the shell, through each of the chambers. Age: Devonian Period. Finally after hundreds of thousands, or millions of years, the land is eroded and the fossil can be seen. Age: Eocene Period. This hardened material is known asCopal, which preserves the inclusion perfectly. Finally after hundreds of thousands, or millions of years, the land is eroded and the fossil can be seen. This hardened material is known as Copal, which preserves the inclusion perfectly. Age: Miocene. Amber Inclusion: Winged Ant Worker Ant 6 Flies. Finally after hundreds of thousands, or millions of years, the land is eroded and the fossil can be seen. This hardened material is known as Copal, which preserves the inclusion perfectly. Age: Miocene. Amber Inclusion: Winged Ant. Finally after hundreds of thousands, or millions of years, the land is eroded and the fossil can be seen. Amber Inclusion: Fly 2 Midges more. Age: Miocene Period. This hardened material is known asCopal, which preserves the inclusion perfectly. Finally after hundreds of thousands, or millions of years, the land is eroded and the fossil can be seen. This hardened material is known as Copal, which preserves the inclusion perfectly. Age: Miocene. Amber Inclusion: 2 Crane flies 2 Dark Winged Gnats more. Finally after hundreds of thousands, or millions of years, the land is eroded and the fossil can be seen. Age: Miocene Period. This hardened material is known asCopal, which preserves the inclusion perfectly. Finally after hundreds of thousands, or millions of years, the land is eroded and the fossil can be seen. Amber Inclusion: 6 Pinhole Borer Beetles Worker Ant. Age: Miocene Period. This hardened material is known asCopal, which preserves the inclusion perfectly. Finally after hundreds of thousands, or millions of years, the land is eroded and the fossil can be seen. Age: Miocene Period. This hardened material is known asCopal, which preserves the inclusion perfectly. Amber Inclusion: 2 Worker Ants Winged Ant 23 Flies/Midges Spider. Finally after hundreds of thousands, or millions of years, the land is eroded and the fossil can be seen. Amber Inclusion: Dark-Winged Fungus Gnat Barklouse Fly Midges. Age: Miocene Period. This hardened material is known asCopal, which preserves the inclusion perfectly. Finally after hundreds of thousands, or millions of years, the land is eroded and the fossil can be seen. Amber Inclusion: Millipede Fly. Age: Miocene Period. This hardened material is known asCopal, which preserves the inclusion perfectly. Finally after hundreds of thousands, or millions of years, the land is eroded and the fossil can be seen. This hardened material is known as Copal, which preserves the inclusion perfectly. Age: Miocene Period. Amber Type: Dominican Amber with Inclusion. Location Found: Dominican Republic. Of the vast amount of prehistoric life that died, it is only a tiny amount that has survived the fossilisation process. This hardened material is known as Copal, which preserves the inclusion perfectly. Age: Cretaceous. Burma Cretaceous Amber is RARE and much older than the more common Baltic and Dominican Amber. Amber with Inclusion . This hardened material is known as Copal, which preserves the inclusion perfectly. Amber Inclusion: Small Parasitic Wasp. Age: Miocene. Finally after hundreds of thousands, or millions of years, the land is eroded and the fossil can be seen. Five Ammonite Fossils, unpolished stones. Please see the description above and the photographs below for details and excellent condition. .
Amber Inclusion: Cricket Leafhopper Nymph. Age: Miocene Period. This hardened material is known asCopal, which preserves the inclusion perfectly. Finally after hundreds of thousands, or millions of years, the land is eroded and the fossil can be seen. Amber Inclusion: Pinhole Borer Beetle. This hardened material is known as Copal, which preserves the inclusion perfectly. Age: Miocene. Finally after hundreds of thousands, or millions of years, the land is eroded and the fossil can be seen. This hardened material is known as Copal, which preserves the inclusion perfectly. Amber Inclusion: Snout Beetle 3 Pinhole Borer Beetles Planthopper 2 Flies. Age: Miocene. Finally after hundreds of thousands, or millions of years, the land is eroded and the fossil can be seen. Combined Weight: 63g. 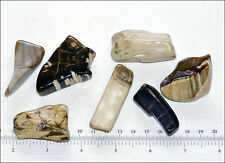 Petrified Wood is good for grounding and protection. Supplied with a velvet pouch. All of a similar size, typically: 2.34cm (0.92") long x 2.01cm (0.79") wide x 1.67cm (0.65") deep. Amber Inclusion: Planthopper. Age: Miocene Period. This hardened material is known asCopal, which preserves the inclusion perfectly. Finally after hundreds of thousands, or millions of years, the land is eroded and the fossil can be seen. Amber Inclusion: [RARE] Small Plant Flies (x14) Midges. Age: Miocene Period. This hardened material is known asCopal, which preserves the inclusion perfectly. Finally after hundreds of thousands, or millions of years, the land is eroded and the fossil can be seen. Amber Inclusion: 12 Pinhole Borer Beetles. This hardened material is known as Copal, which preserves the inclusion perfectly. Age: Miocene. Finally after hundreds of thousands, or millions of years, the land is eroded and the fossil can be seen. Amber Inclusion: Dark-Winged Fungus Gnat 2 midges. This hardened material is known as Copal, which preserves the inclusion perfectly. Age: Miocene. Finally after hundreds of thousands, or millions of years, the land is eroded and the fossil can be seen. This hardened material is known asCopal, which preserves the inclusion perfectly. Finally after hundreds of thousands, or millions of years, the land is eroded and the fossil can be seen. Amber Type: Dominican. This hardened material is known as Copal, which preserves the inclusion perfectly. Age: Miocene. Amber Inclusion: 2 Beetles Fly. Finally after hundreds of thousands, or millions of years, the land is eroded and the fossil can be seen. POCKET MONEY FOSSILS. POLISHED IGUANODON FOSSIL. Polished iguanodon FOSSIL. You are buying 1 fossil. Picked at random. Amber Inclusion: Stingless Bee Winged Ant 3 Midges. This hardened material is known as Copal, which preserves the inclusion perfectly. Age: Miocene. Finally after hundreds of thousands, or millions of years, the land is eroded and the fossil can be seen. Amber Inclusion: Larva Leaf Insect Exoskeleton more. Age: Miocene Period. This hardened material is known asCopal, which preserves the inclusion perfectly. Finally after hundreds of thousands, or millions of years, the land is eroded and the fossil can be seen. 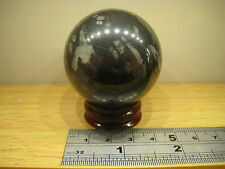 5 Jet Polished 2cm Tumblestones. Combined Weight 30g. Weight: 30g. Jet is good for purification, as it removes negative energies, eminating from other people, that may otherwise be absorbed. 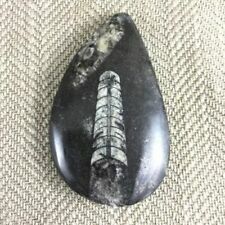 Technically, Jet is not a stone, as it is fossilized wood. Amber Inclusion: Stingless Bee. Age: Eocene Period. This hardened material is known asCopal, which preserves the inclusion perfectly. Finally after hundreds of thousands, or millions of years, the land is eroded and the fossil can be seen. Amber Inclusion: 11 Pinhole Borer Beetles Beetle Gnat more. Age: Miocene Period. This hardened material is known asCopal, which preserves the inclusion perfectly. Finally after hundreds of thousands, or millions of years, the land is eroded and the fossil can be seen. Thesiphuncle is a tube that runs the entire length of the shell, through each of the chambers. This tube had two functions:1. Once filled with water, the nautiloid could force the water out, propelling itself backward with a kind of jet propulsion, which would have served as a quick retreat if feeling threatened.2. This hardened material is known as Copal, which preserves the inclusion perfectly. Age: Miocene. Amber Inclusion: Winged Ant Fly Midges. Finally after hundreds of thousands, or millions of years, the land is eroded and the fossil can be seen. This hardened material is known as Copal, which preserves the inclusion perfectly. Age: Miocene. Amber Inclusion: Winged Ant Beetle 2 Flies. Finally after hundreds of thousands, or millions of years, the land is eroded and the fossil can be seen. Amber Inclusion: Adult and Nymph Planthoppers 2 Worker Ants. This hardened material is known as Copal, which preserves the inclusion perfectly. Age: Miocene. Finally after hundreds of thousands, or millions of years, the land is eroded and the fossil can be seen.